Christian Religion at a glance: Since ages, pilgrimage has been a significant part of every religion. It conveys the desire and commitment of an individual to be converted into the vibes of a sanctified place. Alike all religions, Christianity is also deeply connected with the roots of India. Approximately 25 million Christians are living in India. Some destinations that are worth-mentioning while planning a Christian pilgrimage tour one must visit the holy churches that are mentioned below. South India churches tour is especially made for Christian worshippers. This tour package include fascinating and most cherished destination of South India. 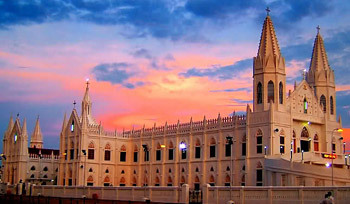 During the itinerary, travelers will explore these striking churches in various cities like Chennai, Trivandrum, Kochi and so on.